Monica is one of the Founders of the Catholic Bloggers Network and continues as an Administrator for the site. Check out Equipping Catholic Families to see what she's up to when she's not over here! Ready to celebrate the rest of Lent as a family? Here are several activities you can do together, whether or not you homeschool. The Velveteen Rabbit by Margery Williams (p). The Tale of Three Trees by Angela Elwell Hunt (p+). The Lion, the Witch, and the Wardrobe by C. S. Lewis (p+ for reading aloud; m+ for independent reading). 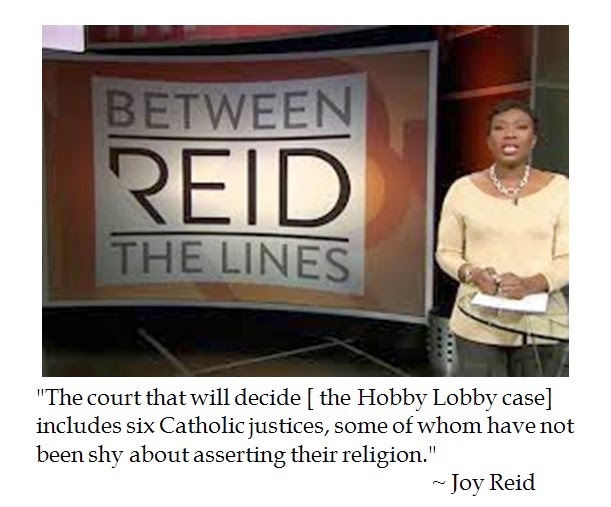 When MSNBC was reporting on the Hobby Lobby which was going to be argued before the US Supreme Court, Joy Reid’s video package included some naked Catholic bigotry. Rather than settle for arguing the merits of Sebilius v. Hobby Lobby for the State (as is MSDNC’s wont) on whether corporate personhood can include religious convictions, Joy Reid impeached the credentials of two thirds of the nation’s highest court based on religion. While Reid’s legal analysis might acknowledge the Religious Freedom Restoration Act of 1993, she is blissfully ignorant of Article VI paragraph 3 of the Constitution regarding no religious test. 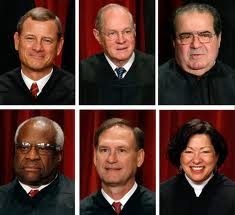 To think that an originalist like Associate Justice Antonin Scalia or natural law jurist like Associate Justice Clarence Thomas would vote en bloc with their wise Latina co-religionist Associate Justice Sonia Sotomayor is drinking liberally spiked Kool-Aid around the ugly fever swamp. Jeff Dunetz observed that MSNBC is hypersensitive about racial implications. So if court commentators hypothetically opined about three African American judges voting together, this would be condemned as racism. 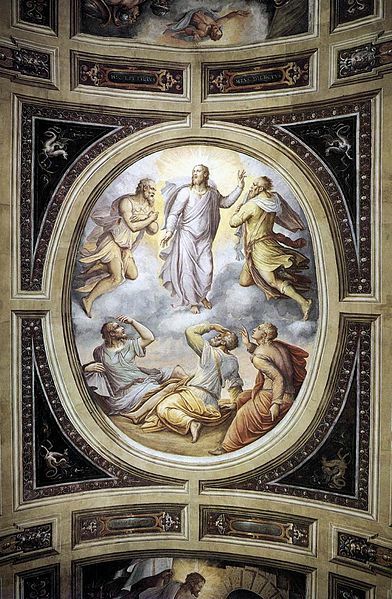 Last week’s Gospel was about the Transfiguration of Jesus. As you recall, Jesus took Peter, James, and John up Mt. Tabor. Moses and Elijah appeared and spoke with Him about His coming Passion. 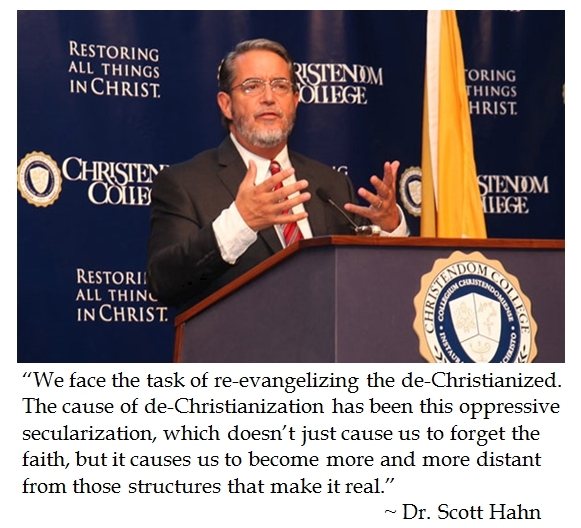 Hearing the Gospel, I was struck by what it teaches us about detachment in the spiritual life. Moses represents the Law. Elijah represents the Prophets. The Law and the Prophets together form the basis of the Old Testament. From the good to the perfect When Peter saw Moses and Elijah, he said, “Lord, it is good for us to be here.” He suggested building booths or tents in which the three religious figures could stay. No doubt he wanted to speak with Moses and Elijah and hear their wisdom in person. But this was not God’s plan. God the Father spoke to the Apostles from the cloud. Then they looked up and saw Jesus standing before them alone. The Law and the Prophets prepared the way for Jesus. But now that Jesus had come, they had to give way. They were good, but the Gospel is better. Moses and Elijah served their purpose in pointing towards Jesus. As St. Paul said, “When the perfect comes, the imperfect passes away” (1 Corinthians 13:10). Today’s post is a throwback to last year’s series Finding God in Children’s Literature. 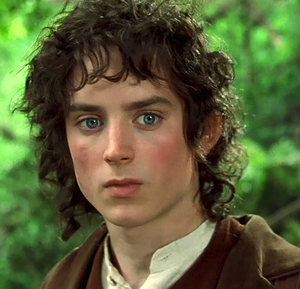 J. R. R. Tolkein’s Lord of the Rings trilogy is not children’s literature, per se, but is suitable for reading aloud with the entire family. I’ve been thinking about a passage from The Fellowship of the Ring lately, and Sunday’s reading on Abraham fits perfectly with it. Traveling to an unknown land“The LORD said to Abram: ‘Go forth from the land of your kinsfolk and from your father’s house to a land that I will show you’” (Genesis 12:1). To fully understand the import of this verse, we must look to the New Testament. By faith Abraham obeyed when he was called to go out to a place which he was to receive as an inheritance; and he went out, not knowing where he was to go (Hebrews 11:8).Abraham followed God down a dark path. He did not know what his destination was, but he trusted God to lead him to a good place. The Lord delights in you! You shall no more be termed Forsaken, and your land shall no more be termed Desolate; but you shall be called My delight is in her, and your land Married; for the LORD delights in you, and your land shall be married. For as a young man marries a virgin, so shall your sons marry you, and as the bridegroom rejoices over the bride, so shall your God rejoice over you (verses 4-5).“The Lord delights in you.” Have you ever thought about that? I can easily understand our delighting in the Lord, but His delighting in us? What could that possibly mean? God is our divine Bridegroom. He calls us to be His bride. When a young man falls in love, he doesn’t dwell on his beloved’s faults. They appear as nothing to him. He sees goodness and beauty that others have overlooked. He desires to give himself fully to her. He desires to know everything about her. Above all, a bridegroom yearns for fruitful union with his bride. he Face of Christ by Claude Mellan (Wikipedia). Early versions of the new constitutions for the Secular Order of Discalced Carmelites defined OCDS members in part as those who ”seek the face of God in prayer” in order to be of service the Church and the world. I love this imagery. Seeking the face of God is the most important aspect of Christian prayer. It separates prayer from eastern meditation techniques and self-seeking under the guise of holiness. 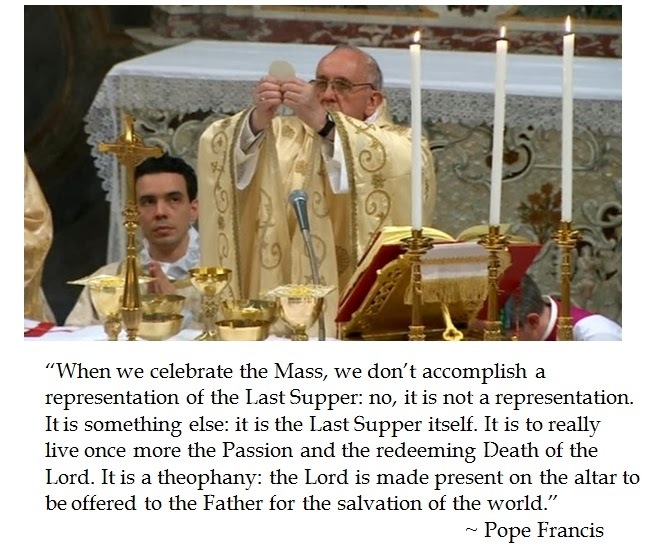 Pope Francis is fond of reminding us that the Christian life is an encounter with Christ. As important as morality is, it cannot take central place. Even such fundamentals as protecting human life and supporting traditional marriage cannot stand alone. Atheists can be pro-life. Muslims can support the traditional family. But only Christians truly encounter Christ. Created, redeemed, and destined for love The Apostle John summed up the Gospel in this manner: “For God so loved the world that he gave his one and only Son, that whoever believes in him shall not perish but have eternal life” (John 3:16). The Gospel begins with God’s love for us. God’s love is at the center of the Christian life. God created us out of the abundance of His love. When we sinned, He sent God the Son to redeem us. By believing in Jesus, we can come to share in God’s eternal love in Heaven. This is what Christianity is all about. Is there a magic bullet to holiness? I don’t know about you, but I’m always looking for a magic bullet to bring me closer to God. Let’s be honest: the Christian life can be a slog. Day in, day out, struggling against sin and making little measurable progress. I’m always looking for the secret to help me reach sanctity faster. But is there one? St. Therese asked herself this same question. She sought a fast way to climb the ladder to Heaven, as it were. The Little Way of Spiritual Childhood was her discovery. She said that if she made herself little, Jesus could lift her up in His arms. His arms would be her elevator to help her advance quickly. Why am I still not a saint? But there is a catch. As much as we might think the Little Way means Jesus does all the work for us, we still have to strive against ourselves. The Little Way is not magic. We can’t just say a few words and be instant saints.